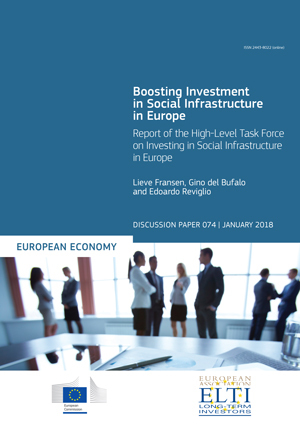 This report by the High-Level Task Force on Investing in Social Infrastructure in Europe, looks at investment in social infrastructure such as healthcare, education and affordable housing. The report is co-published with the European Long-Term Investors Association (ELTI). Discussion Paper 074. January 2018. Brussels. PDF. 116pp. Tab. Graph. Bibliogr. Free. European Economy Discussion Papers are written by the staff of the European Commission’s Directorate-General for Economic and Financial Affairs, or by experts working in association with them, to inform discussion on economic policy and to stimulate debate. The views expressed in this document are solely those of the author(s) and do not necessarily represent the official views of the European Commission.